"Kṛṣṇa is available through His confidential devotee. Not that if anyone has studied very nicely all Vedic literatures he'll understand Kṛṣṇa. No. Maybe, but it is very difficult. Kṛṣṇa can be delivered by His devotee, ātma-bhaktau. Therefore you have to take shelter of Kṛṣṇa's devotee. That is paramparā system. 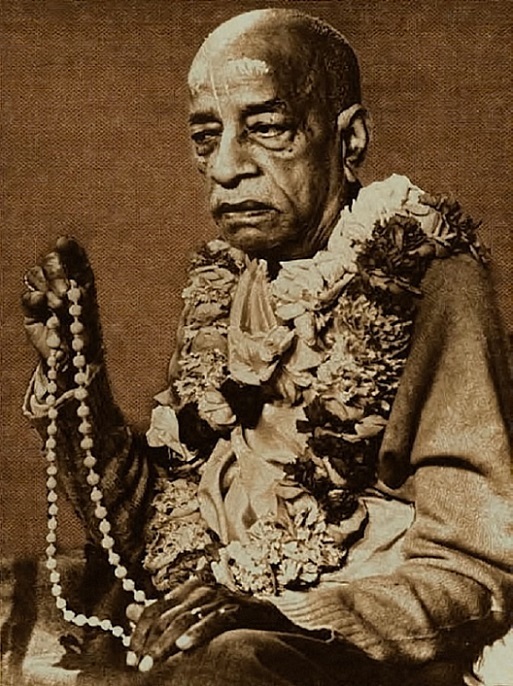 If you want to understand Kṛṣṇa, if you want to have Kṛṣṇa... Bhaktivinoda Ṭhākura has sung a very nice song. He's praying to a Vaiṣṇava, vaiṣṇava ṭhākura tomāra kukkura bhuliyā jānaha more: 'Sir, Vaiṣṇava, you are Ṭhākura. You are as good as Kṛṣṇa, or God. Kindly accept me as your dog.' Vaiṣṇava ṭhākura tomāra kukkura bhuliyā jāna... Kukkura means dog. Just like dog follows the master very faithfully. We have to learn something from the dog. The dog also is a teacher: how to become faithful to the master. That teaching we can have even from the dog. He is very satisfied. Whatever food you give, he'll not protest. Still, he'll remain faithful. There are so many good qualifications of a dog. So therefore Bhaktivinoda Ṭhākura says, vaiṣṇava ṭhākura tomāra kukkura bhuliyā jānaha more: 'Kindly accept me as your dog. I shall serve you faithfully.' Why? Kṛṣṇa se tomāra kṛṣṇa dite pāra: 'Because Kṛṣṇa is yours, you can deliver Kṛṣṇa.' Very nice song. 'Kṛṣṇa is yours. By your devotional service, you have made Kṛṣṇa your property; so you can deliver Kṛṣṇa to me. Therefore I want to follow you as faithfully as a dog.' Vedeṣu durlabham. This is confirmed in the Brahma-saṁhitā: vedeṣu durlabha. If you study independently all the Vedas... Veda is the source of knowledge. So vedeṣu durlabha, it will be difficult. But if we approach Kṛṣṇa's devotee, then it will be very easy."